Another post like the Sock Snowmen that requires little crafting talent, but yields great results. A t-shirt – Try Fruit of the Loom value weight. I got one or £2.49 from ebay and they have all sizes and tons of colours to chose from. A plastic bag or binliner. A copy/picture of a design. 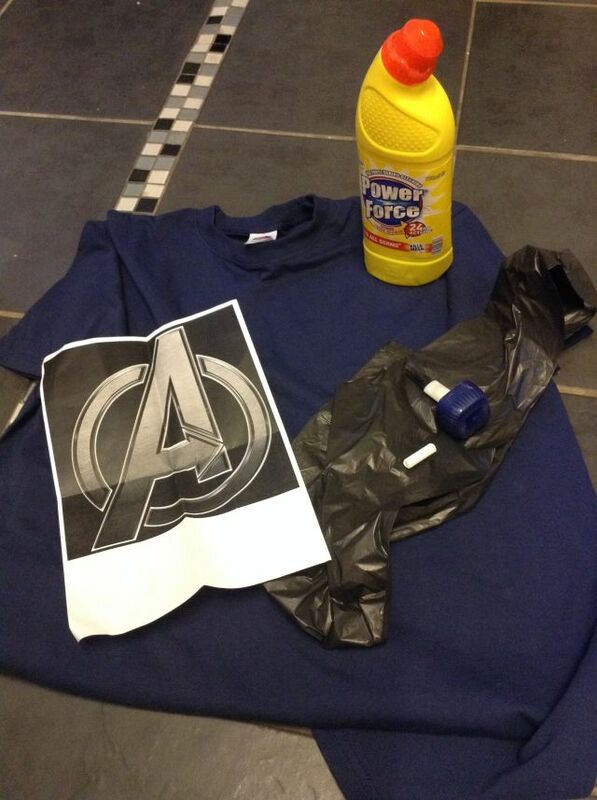 Use the plastic bag inside the shirt to separate the fabric so that only the front is affected by the bleach. Make sure the bag is laid out flat and that your tee is laid out on a flat surface. Outside would be good, but if not possible, choose an area that isn’t carpeted! 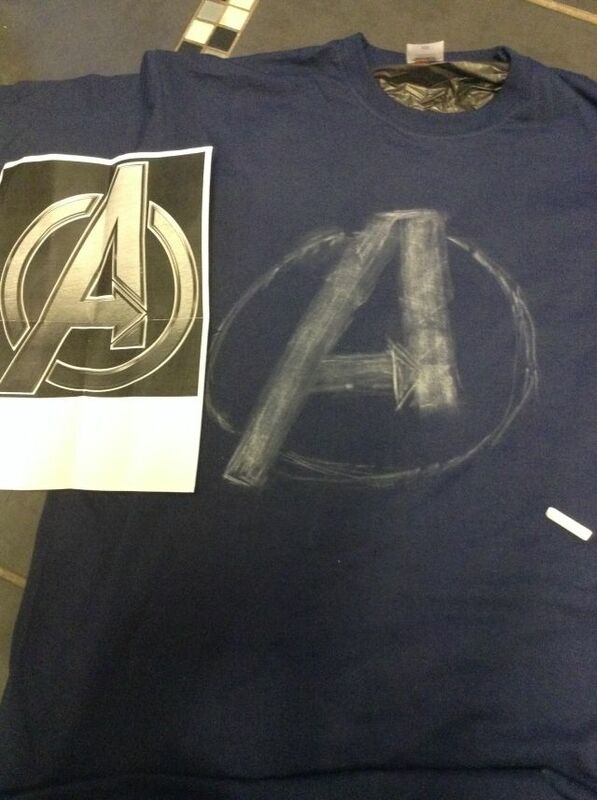 Next, use the chalk to roughly sketch your design. Don’t worry about being too accurate or arty….the look we are aiming for is distressed and a bit splattery so neatness isn’t an issue. My Avengers A looks a bit squished up, but it’s close enough! 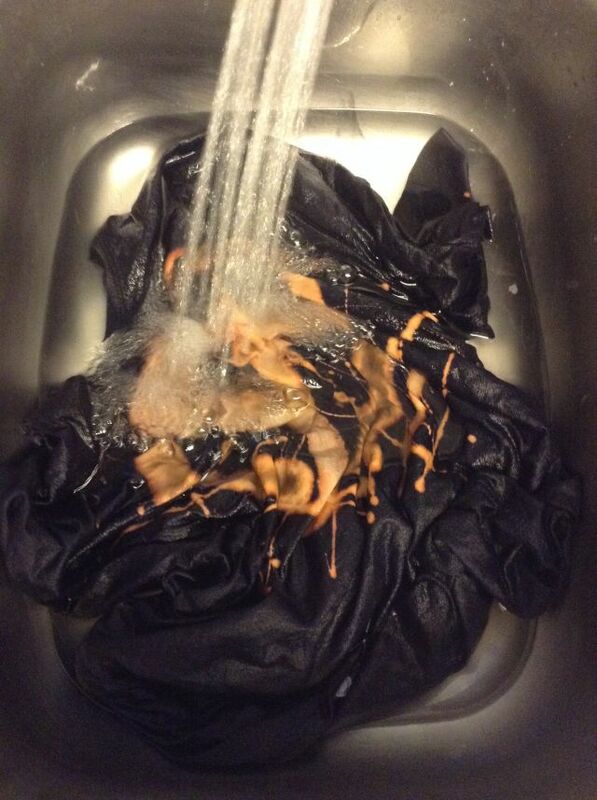 Next, put your shirt in cold water for a couple of minutes to wash away any excess bleach. I ran mine under a cold water tap for 2 minutes, making sure to cover the whole of the bleached design. You could also pop your tee under the shower if that’s easier. The next step is to wring the tee out and pop it into the wash. I washed mine with a tiny amount of washing liquid on a 40 degree quick wash. I left it to dry overnight and this is the final result (which my husband, the recipient of the tee) absolutely loved! There you have it! 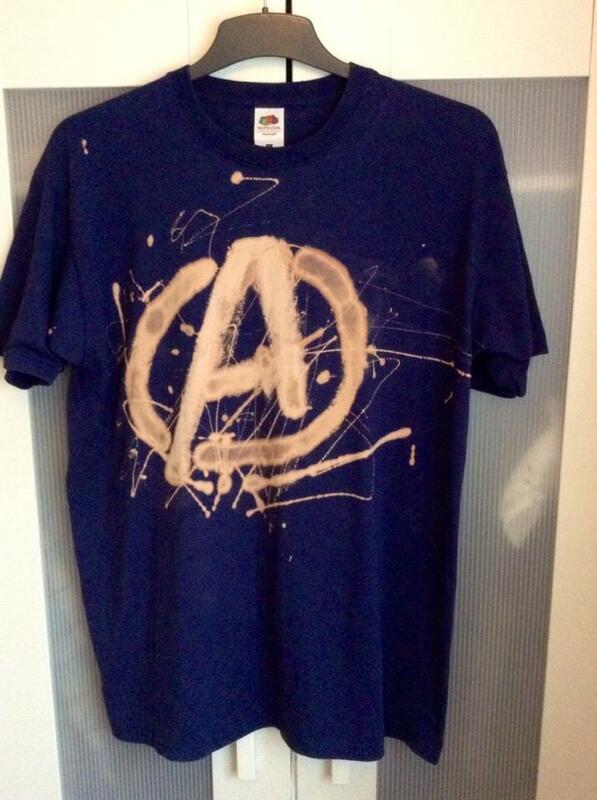 A totally customized, one off tee! 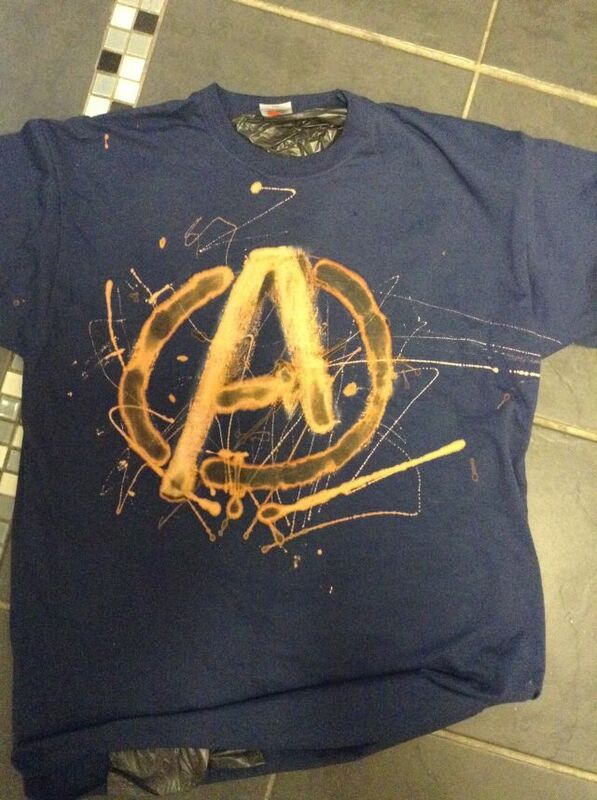 You can try this method with other colour tees to see how different they turn out….or try different fabrics and t-shirt brands to see how the bleach reacts. We are planning an olive tee with a Captain America logo, a burgundy tee with an Iron Man Arc reactor and a brown tee with a Firefly logo. Original inspiration for this project came from this post at Eight & Sixteen. Following on from this post, I thought that those of you who might be following the water plan or were considering giving it a go would appreciate an update. 4 weeks ago, I went from barely any water intake at all to drinking at least a 1 litre jug a day – usually more. Everything was going really well until my entire family contracted a nasty virus that made us unable to keep any food or water down for a few days, which somewhat upset my plan and set it back rather a lot. When I did feel able to drink again after 2 days, it wasn’t much and I was fighting nausea every step of the way. I lost 6lbs in weight and looked like hell, so it was hardly the glowing results I had hoped for! So I have decided to hit the re-set button and start over. A few results I can share with you now, however. I started to see a definite improvement in my urine. It is barely coloured anymore and never smells as it previously had. My joints seem more supple and I no longer struggle to get out of my seat at work or hobble about as my body adjusts after 3 hours of sitting at a desk. My skin has REALLY improved. I have no blemishes at all, and my skin seems smooth and more plumped out. I’m still waiting for something to change under my eyes…..nothing really noticeable as yet. I’ve had a couple of headaches, but that’s all. As a migraine sufferer, I am used to twice weekly headaches as well as monthly migraines. It’s still not completely better, but it is much improved. 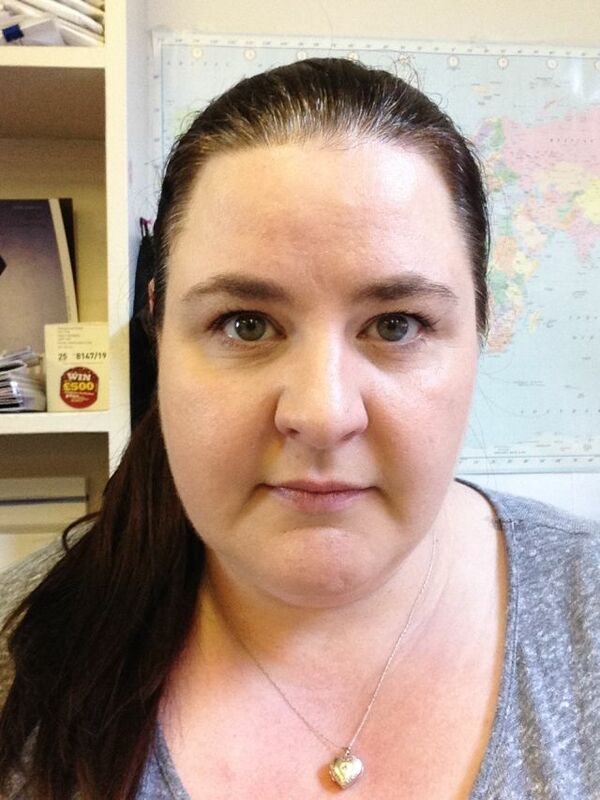 That’s all I can think of for now, but I am hoping to update you again in a month, with my ‘after’ picture. In the meantime, why not click the link above, have a read and try this for yourself? 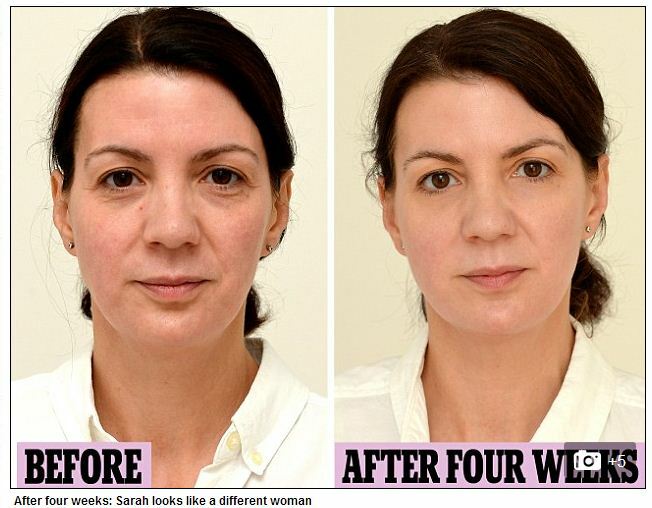 Can drinking water take years off your face? After thinking about how much water I drank each day and admitting the answer was none (I drank tea, coffee and coke! ), I decided that the article might be onto something. I suffer from frequent headaches, often crippling ones which in turn become migraines and incapacitate me for a couple of days at a time. I have noticed that my skin is less firm and there are dark circles and bags under my eyes. I put it down to having a 16 month old who wakes at 6am no matter what, and turning 40 years of age. But what if I am depriving my own body of the very thing it needs most in order to function correctly? 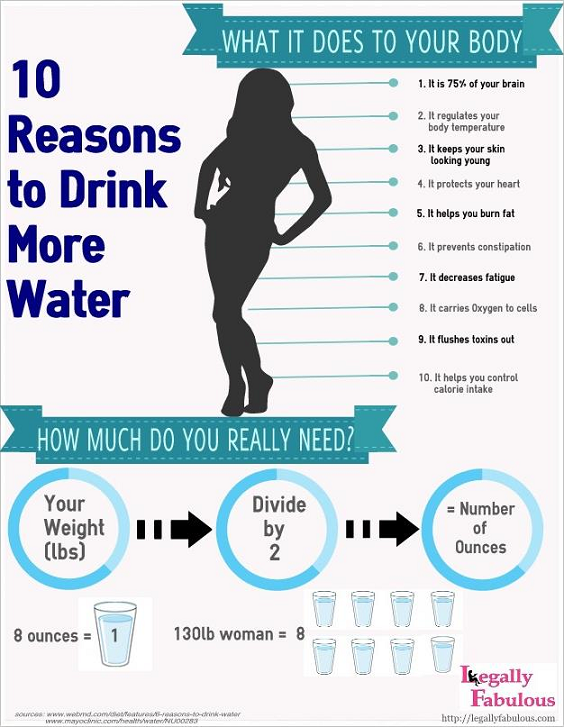 Top 10 Benefits of Drinking Water: Don’t Medicate, Hydrate! 1. Increases Energy & Relieves Fatigue – Since your brain is mostly water, drinking it helps you think, focus and concentrate better and be more alert. As an added bonus, your energy levels are also boosted. 2. Promotes Weight Loss – Removes by-products of fat, reduces eating intake (by filling up your tummy if consumed prior to meals), reduces hunger (hello natural appetite suppressant), raises your metabolism and has zero calories. 4. Improves Skin Complexion – Moisturizes your skin, keeps it fresh, soft, glowing and smooth. Gets rid of wrinkles. It’s the best anti-aging treatment around. 5. 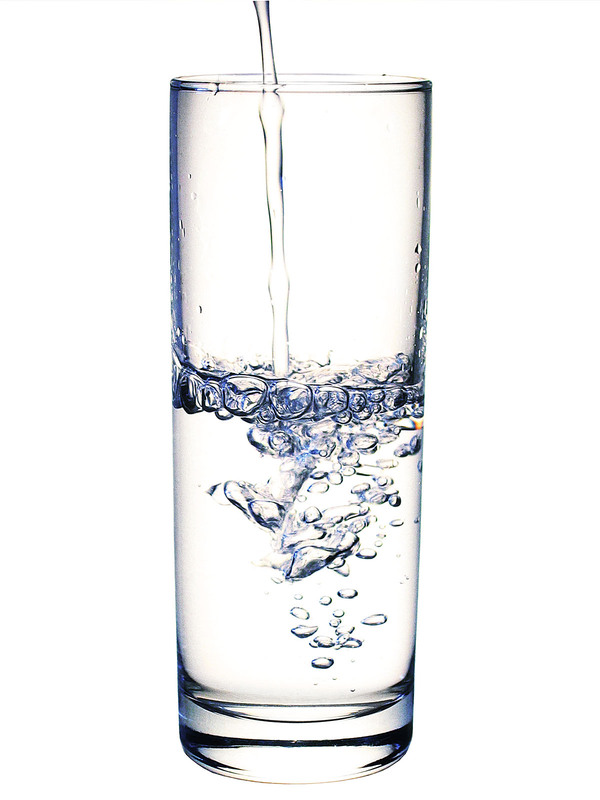 Maintains Regularity – Aids in digestion as water is essential to digest your food and prevents constipation. 9. Puts You in a Good Mood – When the body is functioning at its best, you will feel great and be happy. 10. Save Money! – Water is FREE. Even if you choose bottled/filtered water, it’s STILL cheaper than that high sugar and fat-filled latte. I started drinking a huge jug of water a day 2 days ago. This is day 3, and I have already noticed some slight changes. Because I sit at a desk all day and am very busy, I often forget to get up and move around and when I do, I’m stiff and achy – particularly my right ankle which I have sprained very badly on 3 separate occasions over the years. Yesterday I got up to go for a bathroom break and noticed I had a spring in my step and no aches or stiffness. I thought I was just having a good day and didn’t put it down to water intake until I read the article above, point. 8. My urine is no longer dark yellow. Now it’s a light yellow….hopefully soon to become clear! I’m still waiting for the skin miracle, but it’s early days yet. My selfie is below. I’ll keep you posted and post pictures and updates as I go along. It can’t hurt, right? 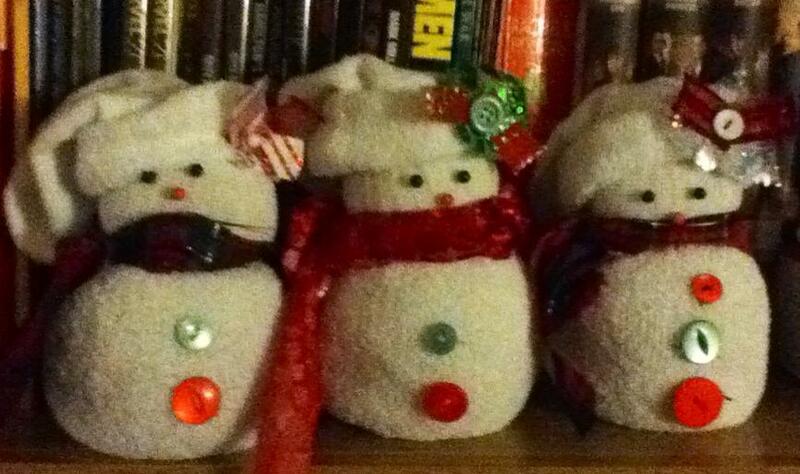 Further to this post, I have now made a grand total of 6 sock snowmen! I think I’ve got it down now and can create one in less than 10 minutes. I’ve also started to get a little more creative with fabrics and crafty bits. Next year I am going to go bigger and better. Below are 2 pictures……batch one contains the first ever rather sad looking snowman and then you can see in batch 2 how I’ve practiced a little more and gotten a little better. I still highly recommend this as a quick and easy Christmas craft that you can do with your kids. 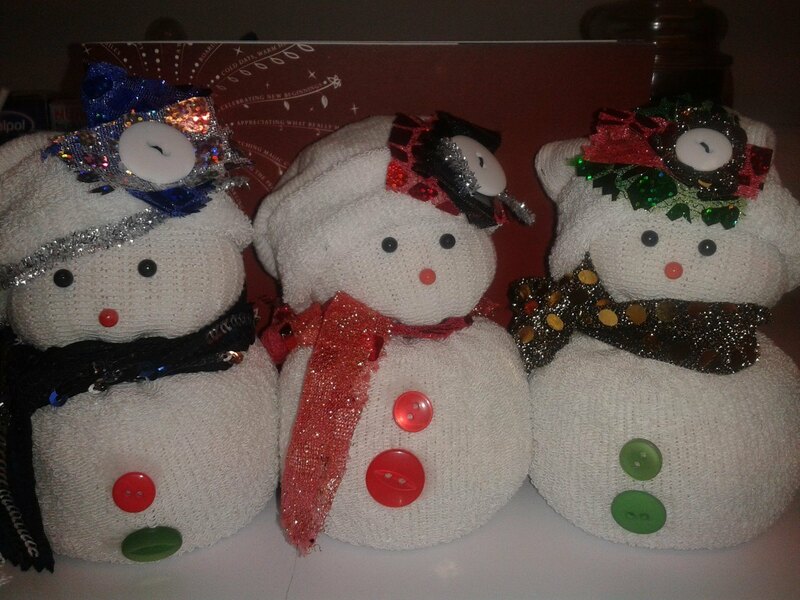 These snowmen make wonderful little stocking filler gifts. I made mine for my mum, 2 sisters and 3 best friends and they love them! Follow the link above for instructions and give it a go! You don’t need many supplies and the result is surprisingly good, while the process is unbelievably easy. Batch #1 – There’s my first ever snowman on the left! 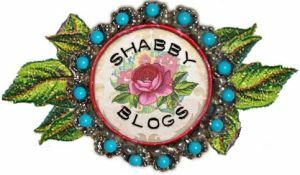 Latest batch – sparkles and pretty hats! 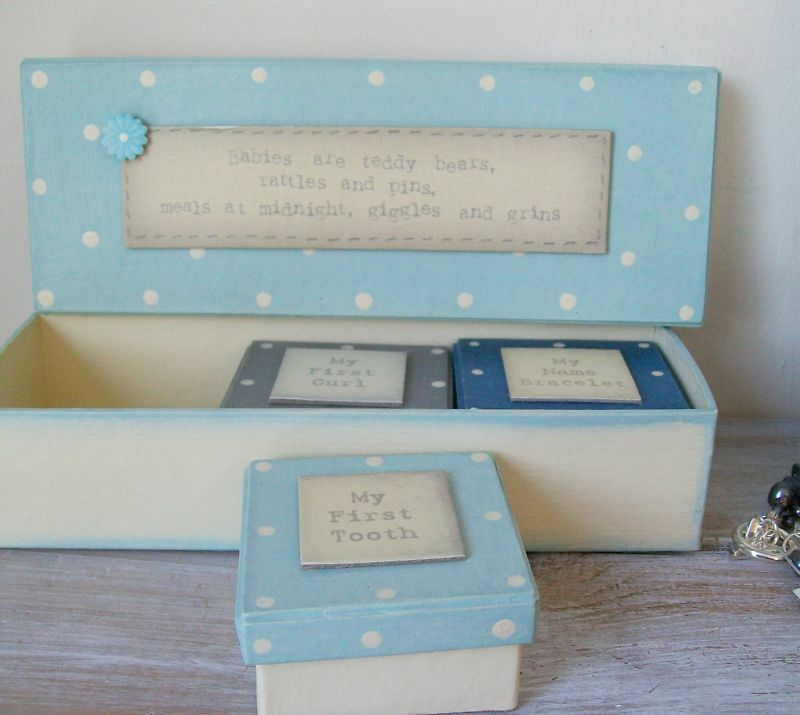 This is the cutest thing I have ever seen, although maybe the ‘my first tooth’ thing is kind of grim. Anyway! I still want it for my little boy when he’s born in just 11 weeks. It’s the sweetest little thing. Ding dong! 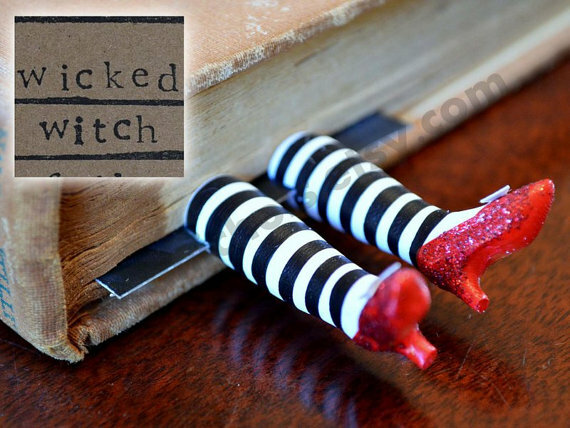 The wicked witch is dead…. …is this the COOLEST book mark ever? Yes, I think it is and I want it! Available to purchase HERE for only £13.41…but the $10 shipping charge is a killer. Wish I could find this in the UK!